This taco filling is made with TVP, also known as Textured Vegetable Protein. We buy the stuff dry in 25# bags for only pennies a pound - one bag easily lasts over a year (I keep it in the freezer). Reconstituted, it has a texture sort-of like ground beef and you can flavor it however you'd like. If you've never tried it, it's easy and pretty much fool-proof. You can purchase TVP in plain, tannish, unflavored crumbles, or in dark brown "beef" or "sausage" flavors. I always use the plain, unflavored, so vary the seasonings here according to what you have. 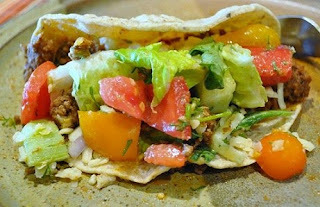 These tacos are one of our weeknight staples; fast, easy, cheap and my kids love them! For even more of a short-cut, leave the onions and peppers out, dump in a cup of salsa instead and serve over chips as a "Mexican Sloppy Joe" sort of thing. In a large skillet, heat the water, juice, soy sauce, ketchup over medium heat to almost boiling. Add the dry TVP granules, stirring well. Turn off heat and cover. Allow the TVP to reconstitute for 5 - 7 minutes. If any liquid is left, you can drain it off. Turn heat back to medium, add oil, then peppers, onions and taco seasoning, stirring well. Allow to cook for another 5 - 7 minutes, stirring frequently until vegetables soften and cook, and taco "meat" begins to dry out and clump and even stick to the pan a bit. Add optional corn and beans if you want them in the taco meat mixture (or just add to the taco later). Stir around to warm slightly. Serve wrapped in a flour tortilla or hard taco shells with all the trimmings. We like our tacos piled high with "extras", it varies depending on what time, budget and the garden allow; favorites include avocados, onions, romaine, black beans, corn, sliced olives, shredded cabbage, cucumbers, vegan cheese and especially the heirloom tomatoes and cilantro that our garden is full of right now! I LOVE tacos! We usually do black beans in ours, but I'll have to try TVP "meat" sometime! I love the texture TVP brings to chili -- I always felt my veggie chili was missing something until I added a cup of dried TVP. Voila! We love TVP tacos, too! Sometimes we do lentils or chickpeas instead, but I like TVP best. That looks AMAZING...I'm always too lazy to prepare TVP, but it does make the perfect taco filling. By the way, I'm passing on this Most Versatile Blogger Award to you! If you'd like to participate, you can check out the details on my blog.